"Tony Hawk's" redirects here. For the comedian, see Tony Hawks. For the eponymous skateboarder himself, see Tony Hawk. Tony Hawk's is a skateboarding video game series published by Activision from 1999 to 2015, and endorsed by the eponymous American professional skateboarder. The series was primarily developed for home consoles by Neversoft from launch to 2007, until Activision transferred the franchise to Robomodo in 2008. At the time the licensing deal between Activision and Hawk expired in 2015, the series had spawned a total of 19 games. Starting out with the initial Tony Hawk's Pro Skater in 1999, the series proved to be one of the most popular and best-selling video game franchises of the early 2000s. Three more Pro Skater games were released from 2000 to 2002, after which the developers took a more story-oriented approach with the releases of Underground, Underground 2 and American Wasteland from 2003 to 2005. Project 8 in 2006 and Proving Ground in 2007 were the last games in the series developed by Neversoft. After that, developer Robomodo took the franchise in a different direction by developing the peripheral supported spin-offs Ride and Shred, released in 2009 and 2010, respectively. Both were commercial and critical failures. Robomodo tried unsuccessfully to revive the series with the back to the roots-oriented releases of Pro Skater HD and Pro Skater 5 in 2012 and 2015. The series spawned several other spin-offs, such as Downhill Jam in 2006, Motion in 2008, and Shred Session in 2014, along with several ports and re-releases. The first six Tony Hawk's received critical acclaim for their unique gameplay, varied soundtracks, and expansion over their predecessors. Tony Hawk's Pro Skater 2 and Pro Skater 3 are critically ranked among the best games released for the PlayStation and PlayStation 2, respectively. However, later entries started getting less favorable reviews, culminating in the games developed by Robomodo being critically panned, with Ride and Pro Skater 5 being named "Worst Games of the Year" by several outlets. After this, Activision let the licensing deal expire while holding all publishing rights. Fans have continued to support the legacy of the series through an online multiplayer fangame called THUG Pro, which uses Underground 2's engine in an all-encompassing collection of levels from the series. On December 3, 2018, Tony Hawk announced the first game in the series not to be published by Activision. The game is called Tony Hawk's Skate Jam, and was released for iOS and Android on December 13, 2018. The Tony Hawk's series was originally developed as a classic arcade game. The goal of most modes of the game is to achieve a highscore. To do this, the player has to successfully perform and combine aerials, flips, grinds, lips, and manuals, with successful executions adding to the player's score. The point value of the trick is based on time maintained, degrees rotated, number of tricks performed in sequence, performing tricks on specific landmarks on the map, and the number of times the tricks have been used. Successful tricks also add to the player's special meter, which, once full, allows for the execution of special tricks which are worth a great deal more than normal tricks. Bails (falling off the skateboard due to poor landing) cause for no points to be awarded for the attempted trick and resets the special bar to empty. The controls of the game developed further the more the series progressed. While the original Tony Hawk's Pro Skater featured a fairly limited set of moves, later entries allowed the player to switch between moves during the same grind or manual sequence, perform transfers, hold on to and drive various vehicles, walk on foot and scale walls, slowing time, or performing more advanced tricks by pressing buttons repeadedly, for example a double or triple kickflip instead of a normal one. Later entries, such as American Wasteland, allowed the player to also use a BMX, whereas Motion and Shred featured snowboarding. The first three Pro Skater games centered around an arcade mode, in which the player is tasked with achieving a highscore, perform certain tasks and collect a number of objects in a limited amount of time. If the player completes enough of these objectives in one level, he unlocks other levels and acquires currency, with which he can improve his character. Also, there are competition levels, in which the player does not have to collect any objects, but perform an excellent score with minimal bails in order to progress. Starting with Pro Skater 2, it was also possible to create a custom character and design individual skateparks. Furthermore, all games until Pro Skater 5 featured local multiplayer, while it was possible to compete in online multiplayer since Tony Hawk's Pro Skater 3. From the first Pro Skater onward, it was possible to access all levels without having to perform tasks and without time limit. This concept was later used in career mode from Pro Skater 4 onwards. Non-player characters give tasks to the player, who could otherwise freely explore the levels without time constraints. Starting with Underground, the series replaced the career mode with a proper story mode. In Underground, Project 8, and Proving Ground, the story centered around the player character turning into a professional skateboarder. In Underground 2, the only direct sequel in the series, on the other hand, the player embarks on a destruction tour around the world, orchestrated by Tony Hawk and Bam Margera. In American Wasteland, which was the first entry to feature one consecutive open world instead of separate levels, the player character intends to rebuild an old skatepark in Los Angeles. After Activision moved the series from Neversoft to Robomodo, the developer significantly changed the general outlet and gameplay of the franchise. Tony Hawk: Ride and its successor, Tony Hawk: Shred introduced a peripheral skateboard which replaced the controller. Aiming to provide a realistic skateboarding experience, turning, leaning, hopping, and other actions on the peripheral device were directly translated into the movements of the in-game character via infrared sensors. However, this resulted in the abandonment of open levels, which were replaced by linear levels that had the character skate on pre-set paths. A similar attempt was made with the Nintendo DS game Tony Hawk's Motion, which used a peripheral device that recognized the leaning of the DS system and had the skater move accordingly. To capitalize on the growing popularity of skateboarding as a sport, Activision approached small developer Neversoft to develop a skateboarding game. According to an interview with one of the developers in 2018, Activision originally wanted a racing game similar to the arcade game Top Skater. However, after Neversoft showed them what their engine was capable of, the racing idea was abandoned in favor of a more free-flowing approach. 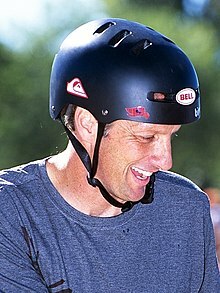 Activision signed professional skateboarder Tony Hawk as the face of the skateboarding game Tony Hawk's Pro Skater. The game had been in development before Hawk was signed as the face of the brand and his name and likeliness were included late in development. Originally, Hawk signed a licensing contract valid until 2002, which was renewed until 2015, following the success of the Pro Skater series. Mitch Lasky, at that time senior vice president of Activision, stated in an interview with GameSpot that the game as well as the character were meant "to reflect Tony's signature style – an intense mix of acrobatics and hard-core technical skating". Hawk himself was involved in the development of the game and his in-game persona, remarking that "[he had] always wanted to help create a video game that represented the reality and excitement of professional skateboarding". Hawk, along with other skaters featured in the game, was animated for the game using motion capture and voiced his character. In early 1998, Activision approached small developer Neversoft to develop a skateboarding racing game, in order to capitalize on the growing popularity of the sport. The idea of a racing game was abandoned in development after Neversoft showed the adaptability of the control engine to various manoveurs. To make the gameplay seem as real as possible, company founder Joel Jewett had a halfpipe built in his backyard and started skateboarding with his coworkers. Also, motion capture was used to make the skateboarding moves seem as realistic as possible. To distance the franchise from other games, the developers opted for licensing modern rock songs, in contrast to the classic music usual for video games at that time. The first game was developed within a year by a 12-person team, and Tony Hawk was added as the face of the franchise only late in development. A month before the release of Tony Hawk's Pro Skater for PlayStation in 1999, Hawk successfully performed a 900 at that years X-Games, which resulted in huge press coverage of the sport and helped boost sales of the title. Also, the inclusion of the game on the Jampack demo for the PlayStation generated further hype, as players were overwhelmed by the at the time unique gameplay. The huge success of the game prompted Neversoft to vastly expand its production staff in order to be able to release Tony Hawk's games on a yearly basis. Neversoft held true to that ambition and released Pro Skater 2 and Pro Skater 3 in 2000 and 2001. Both games retained mostly the same gameplay as their predecessor, along with some improvements. The two games were the most critical acclaimed games for their respective consoles and still rank among the highest rated games of all time. Furthermore, Pro Skater 3 was the first PlayStation 2 game to feature online gameplay. Also, Tony Hawk's Pro Skater 2x, a compilation of the first two games, was released for Xbox in 2001, as the console had not featured the previous entries before. 2002 saw the release of Pro Skater 4, by which time the franchise was among the best-selling video game franchises in the world. This was reflected in the manpower Activision and Neversoft invested in the franchise, as the employees working on the game had risen from 12 for the first entry to 150 and there were significantly more skaters featured, who all received considerable royalties. With the 2003 release of the fifth entry in the series, Underground, the developers used storytelling and exploration to distance their product from the plotless, task-based format of previous Tony Hawk's games, which led Neversoft president Joel Jewett to describe Underground as an adventure game. The game was created with a theme of individuality: it stars an amateur skater in a true story mode, whereas each previous Tony Hawk's game had starred professional skaters and had lacked a plot. One reason for only allowing the player to use a custom character was that certain criminal acts completed in the plot would not reflect well on real-world skaters. Previous games in the series had included character-creation features as well, but Neversoft expanded customization in Underground by implementing face-scanning for the PlayStation 2 version. Regarding the customization options, especially the park editor, producer Stacey Drellishak stated that Neversoft was "trying to create the most customizable game ever". Levels in the console versions of Underground were significantly larger than those of earlier Tony Hawk's games. Neversoft expanded each level until it ceased to run correctly, then shrunk it slightly. Most of the levels were modeled closely after real-world locations; the designers traveled to locales representative of each city in the game and took photographs and videos as reference. Neversoft wanted the player to become familiar with the basic game mechanics quickly and to notice Underground's differences from previous Tony Hawk's titles, who all stuck to roughly the same pattern, immediately. To accomplish this, they introduced the player to foot travel and the ability to climb along ledges in the first few missions of the game. While Neversoft wanted to keep Underground realistic and relatable for the most part, they added driving missions as an enjoyable diversion and to push the boundaries of freedom in skateboarding games. However, these missions were intended not to take away from the main experience of skateboarding. Because Pro Skater 4 had received criticism for its difficulty, Neversoft added four difficulty settings to Underground's story mode. Tony Hawk's Underground 2, released a year after its predecessor, was the only direct sequel in the series. While it still featured a story mode, it took a stark departure from Underground and focused on a "World Destruction Tour" orchestrated by Tony Hawk and Bam Margera. As such, the game tried to capitalize on the immense popularity of Jackass and its related media by also focusing on destruction and self-depreciating pranks. One later review referred to the game being "more of a Jackass game than the Jackass game." This was reflected by the Jackass stars Jason "Wee-Man" Acuña, Stephen "Steve-O" Glover, Margera and his father Phil featuring heavily in the game. Due to some fans being displeased with the absence of the goal-oriented approach of the Pro Skater era, a "Classic Mode" showcasing the old gameplay was included from this entry onwards. The PlayStation Portable exclusive Tony Hawk's Underground 2: Remix contained different levels and a slightly different story and was released during spring 2005. Former developer Chris Rausch recalled that at the time of Underground and Underground 2, the control sheme of the series had reached its limit and Activision instructed Neversoft to develop each new entry around one single new gimmick, such as a story mode or vehicle controls in the Underground subseries, or the open world of American Wasteland. In 2005, American Wasteland was released on the PlayStation 2, Xbox, GameCube, Xbox 360 and later on PC. The game's story mode is set in the city of Los Angeles, where the player character is trying to renovate a run-down skate park. While the game was advertised with featuring one huge comprehensive open world in story mode, the game's world actually comprised several levels, resembling different areas of Los Angeles, which were connected through loading tunnels to make them appear consecutive. Similar to Underground 2, the game includes a classic mode separate from the story mode, which mostly recycles levels of the PSP-exclusive Underground 2: Remix, released earlier that year. Furthermore, the game implemented BMX controls similar to the Mat Hoffman's Pro BMX games, which were also released by Activision. Also similar to its predecessor, the game was accompanied by American Sk8land, a handheld game for Nintendo consoles with slightly different story and levels. The promise of an open world skateboarding game was fulfilled with the next entry in the series, Project 8, released in late 2006. While the PS2 and Xbox versions did not feature said open world, seventh generation of video game consoles, such as the PlayStation 3 and Xbox 360 could support huger content. Once again, the game's story centered on the player character aspiring to become a professional skateboarder, this time by advancing through a rank system to become a part of Tony Hawk's new fictional skateboarding team, the namegiving "Project 8". Unlike as with previous entries, the classic mode was embedded in the different areas of the open world. The game did not appear on Nintendo's new Wii console, which instead saw the release of the then-exclusive spin-off game Downhill Jam, a downhill racing game featuring a mostly fictitious cast. The game was also released on PS2 half a year later. The next title in the main series, 2007 Proving Ground featured a largely similar concept to Project 8, with an open world and the player able to choose three career paths as a skater. Baltimore, Philadelphia, and Washington, D.C. were established as the three open world areas, with each containing three skateable areas, which also featured an integrated classic mode. The game was the first and only entry of the series to compete with rival skateboarding series Skate, which also featured an open world but with more advanced controls and a less arcade-like approach. Skate outsold Proving Ground on a 2:1 ratio, resembling its lackluster reception. With the franchise suffering from product fatigue and appearing to be past its prime, Activision decided to dedicate most of Neversoft's laborforce to the Guitar Hero and Call of Duty franchises. This development would more and more marginalize Neversoft, which was defunct and completely merged with Infinity Ward by 2014. The control of the Tony Hawk's franchise had passed on to Chicago studio Robomodo by 2008. To combat product fatigue and be able to compete with rival EA's Skate series, Activision decided to reboot the series with new developer Robomodo. Due to this, no new entry in the main series was released in 2008. However, the Nintendo DS exclusive spin-off Motion already hinted at the new franchise's new direction, as it featured tilt and motion controls. Furthermore, the game featured the option to snowboard for the first time in the series' history. In 2009, Robomodo released their first entry in the series, Tony Hawk: Ride, which relied on a peripheral-supported controller shaped like a skateboard. The game did not rely on a plot or an open world any longer and featured a completely different control system, with the player railing down a predetermined route, trying to use the skateboard controller to perform tricks on predetermined obstacles. Activision promoted the game as the next step in the evolution of skateboarding video games, however, the game sold poorly and critical reception was negative, with most critics calling the game's $120 price outrageous and the controls non-functioning. GameTrailers named it "Most Disappointing Game of 2009", while GamesRadar named it "Worst Game of the Year". Despite the game's poor reception, a sequel called Shred was released a year later. The game used the same mechanics and concept as its predecessor and reintroduced snowboarding, while aiming at a younger audience. Just like its predecessor, the game was a critical and commercial failure, selling merely 3000 copies in its first week of release in the US. A former developer of Neversoft stated that the idea of a peripheral-supported game came from Activision itself, who were eager to develop peripheral devices for every of their franchises following the success of Guitar Hero. In a 2012 interview, Hawk defended the idea of peripheral-supported games, stating that the original series had become "diluted" and unable to compete with Skate, which made developing games with the then-popular peripheral devices necessary. Furthermore, he blamed biased critics and rushed development for the commercial failure of the games. Because all games in the series released since American Wasteland failed to achieve commercial success, Activision decided to put the franchise on hold. When Robomodo was tasked with developing a new game, it was decided to return to the franchise's roots and develop a port of the original Pro Skater series. Tony Hawk's Pro Skater HD was released in the summer of 2012 via download only and featured a collection of popular levels from Pro Skater 1-3. Critical reception towards the game was mixed, as while critics felt that it captured the appeal of the original games, the content was described as sparse, while the game was said to not deliver updated gameplay mechanics and feeling dated. In 2014, endless runner Shred Session soft launched for mobile devices in a handful of territories but was later pulled from the market, postponed indefinitely and later shelved. After having only produced spin-offs and ports since inheriting the franchise in 2008, Activision announced in mid-2015 that a traditional entry in the series developed by Robomodo would release for PlayStation 3, Xbox 360, PlayStation 4, and Xbox One later that year. To point out its return to the series' roots and heyday, it was named Tony Hawk's Pro Skater 5. In an interview with GameSpot at E3 2015, Hawk stated that Robomodo had consulted with some former Neversoft employees to ensure that the gameplay felt like the original Pro Skater titles. Because the licensing deal between Activision and Tony Hawk was set to expire by the end of 2015, the game was hastily developed within a few months and released unfinished with little promotion. After initial footage received negative feedback by fans and commentators alike for its completely outdated graphics, Robomodo made a complete departure from the attempted realistic look to a cel-shade style two months prior to the game's release. Even though Activision marketed this as a conscious stylistic decision unrelated to the feedback and solely owing to allow a consistent framerate, the end results did not save the game from being bashed by critics upon release in September 2015. Most critics noted that the graphics were inferior even to the games released on the PlayStation 2, while the gameplay barely resembled previous releases and the fact that the game was rendered almost unplayable by numerous bugs. Furthermore, the simplistic, bland environments and missions, as well as the complete absence of NPCs were noted, while some critics pointed out that better levels could have been designed with the Create-a-Park feature of previous games, whereas most levels were simply inferior copies of levels from the original games. The game was so rushed to release that it was unplayable without a 8GB day one patch, with only the tutorial and park creator being accessible. Pro Skater 5 has the fourth-lowest average score of any PlayStation 4 title and the fifth-lowest average score of any Xbox One title and was named the "Worst Video Game of 2015" by Entertainment Weekly. Edge even went so far to call Pro Skater 5 "an insult to its history, to its licensed skaters and sponsors, to modern hardware, and to anyone who plays it." By the end of the year, the license had run out and was not renewed. Robomodo was shut down soon thereafter. The licensing deal between Hawk and Activision expired in December 2015. In January 2017, Hawk stated in an interview that he is in early talks to continue the franchise without Activision and that he was interested in using virtual reality for his next game. In November 2017, Hawk stated that while he would agree to future installments under the Pro Skater moniker, Activision owned all rights to the license and thus controlled whether future games would be made. Meanwhile, fans of Neversoft's original series continued to preserve its levels through THUG Pro, an online multiplayer fangame made using Underground 2's engine. On December 3, 2018, Hawk announced the first game in the series not to be published by Activision. The game is called Tony Hawk's Skate Jam, and was released for iOS and Android on December 13, 2018. Note: Shaded cells represent unlockable skaters. ^ This person is a Secret Skater. ^ This person appears as an NPC. ^ This person also appears in Downhill Jam. ^ This person is a BMXer. ^ This person is a snowboarder. ^ This person is a downloadable skater. These are unlockable characters that have made guest appearances in the Tony Hawk games, while most are real-world celebrities and musicians, others come from properties and licenses that Activision or Neversoft held at the time. As of October 1, 2015. Tony Hawk's Pro Skater was critically acclaimed. IGN gave the N64 version of the game a 9.1 out of 10 praising the gameplay for "genius control, combo system and design" despite little criticism with sound stating "the punk tracks are dumbed down and looped". It also gave the PlayStation version an outstanding rating (9.4 out of 10) again praising the gameplay and the graphics stating it is "simple but amazing in terms of animations, physics, and size of levels". Pro Skater 2 was met with critical acclaim and commercial success, greatly surpassing its predecessor. According to GameRankings, as of October 2013, it is one of the highest rated video games of all time and one of the highest ranking video games of fifth generation for PlayStation, holding the score of 94.75%. It also holds a score of 98, making it one of the highest rated video games of all time across all consoles and platforms, on Metacritic, Pro Skater 2 along with Soulcalibur, and Grand Theft Auto IV are ranked second behind The Legend of Zelda: Ocarina of Time. Jeff Gerstmann of GameSpot praised the PlayStation version, awarding it 9.9/10, saying "as most major publishers' development efforts shift to any number of next-generation platforms, Tony Hawk 2 will likely stand as one of the last truly fantastic games to be released on the PlayStation.". The PlayStation version of the game received a score of 10 out of 10 from the magazine Game Informer, while the rest of the other versions for other consoles received lower scores. In Japan, Famitsu magazine scored the Game Boy Advance version of the game a 33 out of 40 and The PlayStation version of the game a 28 out of 40. In the final issue of the Official UK PlayStation Magazine, the game was chosen as the 7th best game of all time. Game Informer named it the fourth best game ever made in 2001. The staff praised the game for its growth over its predecessor and its impact on its genre. Similarly, the PS2 version of Pro Skater 3 earned a rare perfect 10 score from GameSpot, one of only eleven games to ever receive said score, "Probably because of the freedom given in this game." It was also awarded the best sports game award at E3 2001. IGN rated the game 9.7/10, stating that the game "Should go down in history as one of the best twitch-fests on PS2. Yes, TH3 is that good. The perfect skating game remains just a tiny hair's breadth out of reach, but if you are not satisfied with your purchase of this game, head examinations are recommended." The game is currently the top rated PS2 game on the review aggregate website Metacritic, with an average score of 97/100, tying with Grand Theft Auto III. Famitsu gave the game a 30/40. As for Pro Skater 4, IGN gave the Xbox version a 9/10, stating that "Tony Hawk 4 is by far the best skateboarding title around and head and shoulders above its 'me-too' competition." The PlayStation 2 version received the highest score from IGN, with a 9.3/10, commenting that though the graphics haven't changed from its predecessor, the maps are much larger than in Pro Skater 3, along with praising the increased difficulty. Underground was released to critical acclaim: with scores for the PlayStation 2 at 90% on Metacritic. GameZone's Michael Knutson stated that Underground is "one of the best skating games around" and that players of every skill level would enjoy it. Eurogamer's Tom Bramwell concurred: "as a 'pick-up-and-play' sort of game, THUG is endlessly rewarding once you get your head round the basics, and it's the best entry point for the series to date." Especially the story was well received. Joe Rybicki of Official U.S. PlayStation Magazine celebrated that "for the first time I can remember, an extreme-sports game actually has a real story [with] honest-to-goodness characters". IGN's Douglas Perry called it "a kick, albeit relatively lightweight in nature". He especially praised the pervasive sense of humor in the narrative and in the portrayal of real-world skaters. Knutson called the story "unique" and stated, "I really like that Neversoft had the guts to try something this radical and ditch the formula that they know works so well." The alternate gameplay modes were received very well. Knutson lauded the game's high degree of customization; he summarized that "everything is expounded a hundred fold: from create-a-skater to create-a-park mode, it is simply amazing". He singled out the level editor as one of the deepest he had ever seen. GameSpy's Bryn Williams identified the level editor as an "extremely well-designed" feature that contributed to the overall "brilliance" of the full product. Leeper said that each customization mode is "intuitive and user-friendly", and both he and Rybicki especially enjoyed the trick-creation feature. Reviewers for Famitsu magazine praised the story mode, whose open world format they compared to the Grand Theft Auto series. Knutson and Perry enjoyed the multiplayer, particularly the online Firefight mode. Williams thought similarly and stated that "the most notable disappointment" of the game was the lack of online play for non-PlayStation 2 owners. Harris found the board customization of the Game Boy Advance version to be poorly implemented, though in-depth. Despite his praise for the customization modes, Leeper admitted that his greatest enjoyment still came from "seeking out great lines and beating my scores". While it still got fairly high reviews, critics criticized the story of Underground 2 and some critics noted that the gameplay had not been significantly upgraded from Underground. Silverman and Perry were unimpressed with the short selection of moves introduced in Underground 2. GameSpot agreed, but concluded that "while not all of these changes are all that great, the core gameplay in THUG2 is still very strong". In contrast, Bramwell felt that the Sticker Slap and additional flip and grab tricks were meaningful, enjoyable additions. The addition of Classic mode, was praise by 1UP.com, who considered superior to the Story mode in terms of levels, while adding "Gamers weaned on PS1 Hawks will shed a tear, while newer fans will get a lesson on how things started." American Wasteland's reception was largely similar to that of Underground 2, with the exception that most critics were fond of the game's story. Chris Roper of IGN praised Neversoft's decision to "go back to its roots and make a game about skating" as opposed to "the chaos and destruction of the Underground games." Jeff Gerstmann of GameSpot stated "the saving grace of the story mode is that the story it tells is actually pretty good. It follows the standard 'ragtag group of misfits' struggles to save the place they call home from evil real estate moguls' plot that drove such classic films as Breakin' 2: Electric Boogaloo." Adding that "along the way, the characters become a little endearing". Reviews for Neversoft's entries started to dip with the release of Project 8. In the GameSpot review of the PlayStation 3 version, Project 8 was criticized for its lack of online play on Sony systems and unstable framerate, with critics noting that the series was becoming more and more stale. Proving Ground was met with mixed to positive reviews upon release. On Metacritic, both the Xbox 360 and PlayStation 3 versions had an average score of 72, the PlayStation 2 version had an average score of 65, and the Wii version had an average score of 57. All of these scores are considered "mixed or average" by the site. The PlayStation 2 and Nintendo Wii versions were criticized for not having the same mechanics that are in the PlayStation 3 and Xbox 360 versions. The Nintendo DS version received generally favorable reviews from critics. On Metacritic it received an average score of 79 out of 100 based on 21 reviews. On GameRankings it received an average score of 78% based on 19 reviews. Notably however, the game received a 9/10 from the Official UK Xbox Magazine. The Official UK PlayStation Magazine awarded the game 7/10. As Robomodo began producing Tony Hawk's games, the reviews immediately dropped deep into negative. Tony Hawk: Ride received negative reviews from critics. The Metacritic average score of 46, 44, and 47 for the Xbox 360, PlayStation 3, and Wii versions respectively indicates "generally unfavorable reviews." GameTrailers gave Tony Hawk: Ride a score 4.6 and named it Most Disappointing Game of 2009, while IGN gave the game a 5.0. Both G4TV and Giant Bomb rated it 1/5. GameSpot gave it a 3.5/10, with the only positive emblem the game received being that the peripheral was "sturdy". GamesRadar gave the game 4/10. They also named it the worst game of the year, using its skateboard peripheral as the trophy for the "Anti-Awards" feature. Game Informer gave it a 5.75, remarking that "As a skateboarder and as a gamer, Tony Hawk: Ride is a curious idea but a letdown in practice. The huge level of frustration is not worth the time it takes to master the awkward gameplay idiosyncrasies." Unlike its predecessors, Pro Skater HD was able to at least attain mixed reviews. IGN's Nic Vargas gave the game a score of 8/10, praising its purist gameplay whilst lamenting the lack of certain modes such as park creator and split screen multiplayer. The reviewer from GameTrailers gave the game a score of 7.4 and stated that Pro Skater HD "isn't flawless, but... it at least gets off on the right foot." Lucas Sullivan of GamesRadar felt that "old-school fans of the franchise will be disappointed by what the game lacks, and gamers who’ve never laid eyes on a PS1 will find the mechanics and level design sparse." Destructoid gave the game 4.5/10, stating that the execution isn't handled as well as the original titles, as well as some of the design choices the developer made. G4TV gave the game a 4.5/5 and praised the console versions' online multiplayer and soundtrack. Official Xbox Magazine gave Pro Skater HD an 8/10. They praised the game's new big head mode. Pro Skater 5 reverted to catastrophic reviews again, the game was bashed by critics upon release in September 2015. Most critics noted that the graphics were inferior even to the games released on the PlayStation 2, while the gameplay barely resembled previous releases and was rendered almost unplayable by numerous bugs. Furthermore, the simplistic, bland environments and missions and complete absence of NPCs were noted, some critics pointed out that better levels could have been designed with the Create-a-Park feature of previous games, while most levels were simply inferior copies of levels from the original games. The game was so rushed to release that it was unplayable without a 8GB day one patch, with only the tutorial and park creator being accessible. Pro Skater 5 has the fourth-lowest average score of any PlayStation 4 title and the fifth-lowest average score of any Xbox One title and was named the "Worst Video Game of 2015" by Entertainment Weekly. Edge even went so far to call Pro Skater 5 "an insult to its history, to its licensed skaters and sponsors, to modern hardware, and to anyone who plays it." The PlayStation version of Tony Hawk's Pro Skater received a "Platinum" sales award from the Entertainment and Leisure Software Publishers Association (ELSPA), indicating sales of at least 300,000 copies in the United Kingdom. In the United States, Tony Hawk's Pro Skater 2's computer version sold 320,000 copies and earned $8.0 million by August 2006, after its release in October 2000. It was the country's 58th best-selling computer game between January 2000 and August 2006. Combined sales of all Pro Skater computer games released between January 2000 and August 2006 had reached 440,000 units in the United States by the latter date. Also in the United States, the game's Game Boy Advance version sold 680,000 copies and earned $24 million by August 2006. During the period between January 2000 and August 2006, it was the 38th highest-selling game launched for the Game Boy Advance, Nintendo DS or PlayStation Portable in that country. The game's PlayStation version received a "Platinum" sales award from the Entertainment and Leisure Software Publishers Association (ELSPA), indicating sales of at least 300,000 copies in the United Kingdom. By July 2006, the PlayStation 2 version of Tony Hawk's Pro Skater 3 had sold 2.1 million copies and earned $77 million in the United States. Next Generation ranked it as the 14th highest-selling game launched for the PlayStation 2, Xbox or GameCube between January 2000 and July 2006 in that country. Combined sales of Tony Hawk console games released in the 2000s reached 10.7 million units in the United States by July 2006. Its PlayStation 2 version also received a "Platinum" sales award from the Entertainment and Leisure Software Publishers Association (ELSPA), indicating sales of at least 300,000 copies in the United Kingdom. By July 2006, the PlayStation 2 version of Tony Hawk's Pro Skater 3 had sold 2.1 million copies and earned $77 million in the United States. Next Generation ranked it as the 14th highest-selling game launched for the PlayStation 2, Xbox or GameCube between January 2000 and July 2006 in that country. Combined sales of Tony Hawk console games released in the 2000s reached 10.7 million units in the United States by July 2006. Its PlayStation 2 version also received a "Platinum" sales award from the Entertainment and Leisure Software Publishers Association (ELSPA), indicating sales of at least 300,000 copies in the United Kingdom. In Europe, the PlayStation 2, Xbox, and GameCube versions of Underground were respectively the fifth, sixth, and eighth-best selling games for those consoles the week after the game's release,. It would remain uninterrupted in the top twenty of every week until January 24, 2004, for the Xbox and GameCube and February 21 for the PlayStation 2, inclusive. As of December 2007, the PlayStation 2 edition of the game had sold 2.11 million copies in the United States. The GameCube version made Nintendo's Player's Choice list by selling 250,000 copies in the United States. Its PlayStation 2 version also received a "Platinum" sales award from the Entertainment and Leisure Software Publishers Association (ELSPA), indicating sales of at least 300,000 copies in the United Kingdom. Skate outsold Proving Ground on a 2:1 ratio, resembling its lackluster reception. In the first month of its U.S. release, Tony Hawk: Ride sold 114,000 copies. During its first week on sale in the United States, the game sold 3,000 copies; Due to this, former developer Chris Rausch described Tony Hawk: Shred as the game that had killed the series and stated he expected no new game to release in the foreseeable future. Since the expiration of the license from Activision, the Tony Hawk's Pro Skater fanbase has largely sustained itself through THUG Pro, a fan-made total conversion mod of Tony Hawk's Underground 2 for Microsoft Windows and macOS that features levels of every game in the series for use in online multiplayer. In March 2017, a documentary about the Pro Skater series was announced by former Neversoft employee and producer of the series, Ralph D'Amato. The documentary, titled Pretending I'm a Superman: The Tony Hawk Video Game Story, features interviews from former Neversoft employees as well as skaters featured throughout the series, including Hawk himself and is directed by Ludvig Gür. In January 2018, it was announced that production had wrapped and that the documentary is set to be released in 2019. ^ a b c d Mangalindan, JP (December 1, 2016). "Tony Hawk wants his next video game to use VR". Yahoo Finance. Retrieved January 28, 2017. ^ a b c d "Tony Hawk's Pro Skater 2 Reviews". Metacritic. Retrieved October 1, 2011. ^ a b Jeff Gerstmann, GameSpot (October 29, 2001). "Tony Hawk's Pro Skater 3 Review". Gamespot. Retrieved January 4, 2011. ^ a b c "Tony Hawk's Pro Skater 3 Reviews". Metacritic. Retrieved October 1, 2011. ^ a b "The Anti-Awards 2009". ^ a b c "GameTrailers Game of the Year Awards 2009 - Most Disappointing Game". GameTrailers. Retrieved December 26, 2009. ^ a b c EW Staff (December 11, 2015). "The 10 Best (And 3 Worst!) Video Games of 2015". Entertainment Weekly. Retrieved December 13, 2015. ^ a b Watercutter, Angela (November 15, 2017). "Twitter aksed Tony Hawk how to do a 540 McTwist. Tony Hawk answered". Wired. Retrieved December 30, 2017. ^ a b Hester, Blake (January 25, 2018). "Tony Hawk Pro Skater Fans Are Keeping the Series Alive With Mods". Vice. Retrieved March 26, 2018. ^ a b c d e f "Talking to the Original Designer of Tony Hawk's Pro Skater". GameBrain. January 1, 2018. Retrieved January 10, 2018. ^ a b Barton, Matt (March 10, 2009). "The History of Tony Hawk's Pro Skater: Ollies, Grabs, and Grinds". Gamasutra. Retrieved April 18, 2016. ^ Calvert, Justin (July 24, 2002). "Tony Hawk signs new deal with Activision". Gamespot. Retrieved April 18, 2016. ^ Mullen, Michael (January 14, 1999). "Tony Hawk Takes Air". GameSpot. Retrieved April 17, 2010. ^ a b Fielder, Lauren (August 26, 1999). "Female Skater Joins Tony Hawk". GameSpot. Retrieved April 17, 2010. ^ "Tony Hawk's Pro Skater — Credits — allgame". Allgame. Retrieved April 18, 2010. ^ a b c d e f Lien, Tracey (July 22, 2014). "The studio that made Tony Hawk's Pro Skater closed, here's its billion-dollar story". Polygon. Retrieved May 21, 2016. ^ Kohn, David (December 10, 2002). "Tony Hawk Takes Off". CBS News. Retrieved May 22, 2016. ^ Ian Michna (September 2, 2014). "The Andrew Reynolds Interview". Jenkem. Jenkem. Retrieved November 16, 2014. ^ a b c Perry, Douglass C. (October 6, 2003). "Tony Hawk's Underground: Hands-On". IGN. Retrieved June 4, 2014. ^ a b "Still Tony from the Block: Skating gets back to its roots in Tony Hawk's Underground". Electronic Gaming Monthly (172): 100–101. November 2003. ^ a b Wiley, Mike (August 29, 2003). "TONY HAWK'S UNDERGROUND: IN-DEPTH LOOK". IGN. Retrieved May 22, 2016. ^ a b "Notes from the Underground". Computer and Video Games. August 4, 2003. Archived from the original on December 8, 2003. Retrieved May 22, 2016. ^ a b "THUGged out! New Tony Hawk's revealed". Computer and Video Games. August 4, 2003. Archived from the original on July 5, 2007. Retrieved September 28, 2014. ^ Padilla, Raymond (October 6, 2003). "Tony Hawk's Underground: Sporting the legendary THPS trick system and a heavier story, Neversoft is set to deliver gaming's first skateboarding adventure". GameSpy. Retrieved September 28, 2014. ^ a b Perry, Douglass C. (October 7, 2004). "TONY HAWK'S UNDERGROUND 2". IGN. Retrieved May 22, 2016. ^ Hunt, Iain (May 22, 2014). "Jackasses in the Underground". Stickskills. Retrieved May 22, 2016. ^ McGarvey, Sterling (October 19, 2005). "The History of Tony Hawk's Pro Skater: Ollies, Grabs, and Grinds". GameSpy. Retrieved December 21, 2016. ^ a b Miller, Ross (January 2, 2008). "Skate outsells Tony Hawk 'nearly' 2 to 1". Joystiq. Retrieved December 21, 2016. ^ McWhertor, Michael. "Activision Takes Axe To Guitar Hero's Neversoft, Shuts Down Luxoflux". Kotaku. ^ a b Klepek, Patrick. "Infinity Ward, Neversoft Merging into Single Super Studio". Giant Bomb. ^ Phillips, Tom (July 10, 2014). "Tony Hawk studio Neversoft bids farewell, burns eyeball effigy". Eurogamer. Retrieved July 11, 2014. ^ a b Chester, Nick (December 9, 2009). "Review: Tony Hawk: Ride". Destructoid. Retrieved December 28, 2017. ^ a b "Tony Hawk: Ride Review". IGN. November 20, 2009. Retrieved December 28, 2017. ^ slateman (August 21, 2008). "Hawk DS News". GameSpy. Archived from the original on September 14, 2008. ^ "The Anti-Awards 2009". GamesRadar. January 7, 2010. Retrieved December 28, 2017. ^ Sharkey, Mike (August 16, 2010). "Activision Details Tony Hawk: Shred". Gamespy. Retrieved December 28, 2017. ^ Purchese, Robert (November 17, 2010). "Tony Hawk Shred sold how many?". Eurogamer. Retrieved December 28, 2017. ^ Kane, Darryl (November 17, 2010). "Tony Hawk: Shred Bombs In North America". Gaming Union. Retrieved December 28, 2017. ^ Hinkle, David (August 3, 2012). "Tony Hawk says Ride was 'a bit rushed,' still thinks critics didn't give his board a chance". Engadget. Retrieved December 28, 2017. ^ a b Pinsof, Allistair (July 18, 2012). "Review: Tony Hawk's Pro Skater HD". Destructoid. Retrieved July 23, 2012. ^ Gerstmann, Jeff (July 18, 2012). "Tony Hawk's Pro Skater HD Review". Giant Bomb. Retrieved July 18, 2012. ^ Hodapp, Eli. "'Tony Hawk's Shred Session' Postponed Indefinitely, New Console and Mobile 'Tony Hawk' Game Coming in 2015". TouchArcade.com. Retrieved November 7, 2014. ^ Jayne, Jeremy (June 16, 2015). "Talking To Tony Hawk About Tony Hawk Pro Skater 5 – E3 2015". GameSpot. Retrieved June 16, 2015. ^ Maiberg, Emanuel (September 30, 2015). "SkaterGate: Did Activision Rush Tony Hawk Pro Skater 5' for Legal Reasons?". Vice. Retrieved December 30, 2017. ^ Tamburro, Paul (September 30, 2015). "Activision May Have Left Tony Hawk's Pro Skater 5 to Die Because its License Expires in 2015". CraveOnline. Retrieved December 30, 2017. ^ Albert, Brian (August 5, 2015). "Tony Hakw's Pro Skater 5 Has A New Artstyle". IGN. Retrieved October 19, 2015. ^ Pereira, Chris (August 13, 2015). "This Is Why Tony Hawk's Pro Skater 5 Changed Visual Style". GameSpot. Retrieved October 19, 2015. ^ a b c d "10 Games That Were Broken on Release". Retrieved October 17, 2015. ^ a b "Writing About Games:Tony Hawk's Pro Skater 5". Archived from the original on November 17, 2015. Retrieved October 19, 2015. ^ a b "Tony Hawk's Pro Skater 5 Panned Upon US Release". Archived from the original on November 17, 2015. Retrieved October 19, 2015. ^ a b Fahey, Mike (September 29, 2015). "Behold, The Terrible Tony Hawk's Pro Skater 5". Kotaku. Retrieved December 30, 2017. ^ a b "Best PlayStation 4 Video Games of All Time". Retrieved July 26, 2016. ^ a b "Best Xbox One Video Games of All Time". Retrieved October 26, 2015. ^ a b "Tony Hawk's Pro Skater 5". Edge. Bath: Future Publishing (286): 118–119. December 2015. ^ "Tony Hawk says new game is in the works, without Activision's involvement". ^ Makuch, Eddie (January 31, 2017). "Tony Hawk Working On New Game Without Activision". ^ ""Tony Hawk's Pro Skater 5" terá skatista brasileira". ^ "Tony Hawk's Pro Skater Reviews". GameRankings. Retrieved October 1, 2011. ^ "Tony Hawk's Pro Skater Reviews". Metacritic. Retrieved October 1, 2011. ^ "Tony Hawk's Pro Skater 2 Reviews". GameRankings. Retrieved October 1, 2011. ^ a b "Tony Hawk's Pro Skater 2". Gamerankings. Retrieved July 1, 2014. ^ "Tony Hawk's Pro Skater 2x Reviews". GameRankings. Retrieved October 1, 2011. ^ "Tony Hawk's Pro Skater 2 Reviews". Metacritic. Retrieved October 1, 2011. ^ "Tony Hawk's Pro Skater 2x Reviews". Metacritic. Retrieved October 1, 2011. ^ "Tony Hawk's Pro Skater 3 Reviews". GameRankings. Retrieved October 1, 2011. ^ "Tony Hawk's Pro Skater 3 Reviews". Metacritic. Retrieved October 1, 2011. ^ "Tony Hawk's Pro Skater 4 Reviews". GameRankings. Retrieved October 1, 2011. ^ "Tony Hawk's Pro Skater 4 Reviews". Metacritic. Retrieved October 1, 2011. ^ "Tony Hawk's Underground Reviews". GameRankings. Retrieved October 1, 2011. ^ "Tony Hawk's Underground Reviews". Metacritic. Retrieved October 1, 2011. ^ "Tony Hawk's Underground 2 Reviews". GameRankings. Retrieved October 1, 2011. ^ "Tony Hawk's Underground 2 Remix Reviews". GameRankings. Retrieved October 1, 2011. ^ "Tony Hawk's Underground 2 Reviews". Metacritic. Retrieved October 1, 2011. ^ "Tony Hawk's Underground 2 Remix Reviews". Metacritic. Retrieved October 1, 2011. ^ "Tony Hawk's American Sk8land Reviews". GameRankings. Retrieved October 1, 2011. ^ "Tony Hawk's American Wasteland Reviews". GameRankings. Retrieved October 1, 2011. ^ "Tony Hawk's American Sk8land Reviews". Metacritic. Retrieved October 1, 2011. ^ "Tony Hawk's American Wasteland Reviews". Metacritic. Retrieved October 1, 2011. ^ "Tony Hawk's Project 8 Reviews". GameRankings. Retrieved October 1, 2011. ^ "Tony Hawk's Project 8 Reviews". Metacritic. Retrieved October 1, 2011. ^ "Tony Hawk's Downhill Jam Reviews". GameRankings. Retrieved October 1, 2011. ^ "Tony Hawk's Downhill Jam Reviews". Metacritic. Retrieved October 1, 2011. ^ "Tony Hawk's Proving Ground Reviews". GameRankings. Retrieved October 1, 2011. ^ "Tony Hawk's Proving Ground Reviews". Metacritic. Retrieved October 1, 2011. ^ "Tony Hawk's Motion Reviews". GameRankings. Retrieved October 1, 2011. ^ "Tony Hawk's Motion Reviews". Metacritic. Retrieved October 1, 2011. ^ "Tony Hawk: Ride Reviews". GameRankings. Retrieved October 1, 2011. ^ "Tony Hawk: Ride Reviews". Metacritic. Retrieved October 1, 2011. ^ "Tony Hawk: Shred Reviews". GameRankings. Retrieved October 1, 2011. ^ "Tony Hawk: Shred Reviews". Metacritic. Retrieved October 1, 2011. ^ "Tony Hawk's Pro Skater HD Reviews". GameRankings. Retrieved October 1, 2011. ^ "Tony Hawk's Pro Skater HD Reviews". Metacritic. Retrieved October 1, 2011. ^ "Tony Hawk's Pro Skater 5 Reviews". GameRankings. Retrieved October 1, 2011. ^ "Tony Hawk's Pro Skater 5 Reviews". Metacritic. Retrieved October 1, 2011. ^ "Game Releases by Score". Metacritic. Retrieved July 1, 2014. ^ "Tony Hawk's Pro Skater 2 Review - Gamespot". GameSpot. Retrieved November 23, 2017. ^ ゲームボーイアドバンス - SK8 トニーホークのプロスケーター2. Weekly Famitsu. No.915 Pt.2. Pg.116. 30 June 2006. ^ "トニー・ホーク プロスケーター2 まとめ [PS] / ファミ通.com". Kadokawa Dwango. Retrieved March 5, 2017. ^ Gerstmann, Jeff (October 29, 2001). "Tony Hawk's Pro Skater 3 for PlayStation 2 Review". GameSpot. Retrieved January 19, 2014. ^ "Game Reviews, Video Game Reviews – Gamespot". Retrieved January 19, 2014. ^ Smith, David (October 31, 2001). "Tony Hawk's Pro Skater 3 Review". IGN. Retrieved April 9, 2012. ^ "Tony Hawk's Pro Skater 3 (ps2) reviews at Metacritic.com". Metacritic. Retrieved April 5, 2012. ^ プレイステーション2 – トニー・ホーク プロスケーター3. Weekly Famitsu. No.915 Pt.2. Pg.94. 30 June 2006. ^ Boulding, Aaron (October 25, 2002). "Tony Hawk's Pro Skater 4 Review". IGN. Retrieved May 4, 2013. ^ Smith, David (October 23, 2002). "Tony Hawk's Pro Skater 4". IGN. Retrieved May 4, 2013. ^ "Tony Hawk's Underground for PlayStation 2". GameRankings. Archived from the original on April 14, 2014. Retrieved June 1, 2014. ^ "Tony Hawk's Underground for Xbox". GameRankings. Archived from the original on April 13, 2014. Retrieved June 1, 2014. ^ a b c d Knutson, Michael (November 11, 2003). "Tony Hawk's Underground by Activision Inc". GameZone. Archived from the original on April 13, 2005. Retrieved June 2, 2014. ^ Bramwell, Tom (December 1, 2003). "Tony Hawk's Underground: Tony's back, and this time he's you!". Eurogamer. Archived from the original on December 22, 2004. Retrieved June 1, 2014. ^ a b Rybicki, Joe (January 2004). "Tony Hawk's Underground". Official U.S. PlayStation Magazine (76). ^ Perry, Douglass (October 28, 2003). "Tony Hawk's Underground: Neversoft takes its game to the people. The full review". IGN. Archived from the original on October 17, 2008. Retrieved June 1, 2014. ^ a b Williams, Bryn (October 27, 2003). "Tony Hawk's Underground (GCN)". GameSpy. Archived from the original on August 13, 2006. Retrieved June 1, 2013. ^ a b Leeper, Justin. "In Hawk We Trust". Game Informer. Archived from the original on March 2, 2008. Retrieved October 7, 2014. ^ "30 Point Plus: トニー・ホーク プロスケーター2003". Famitsu (1284): 45. July 25, 2013. ^ Harris, Craig (October 27, 2003). "Tony Hawk's Underground: It's a remarkable feat to make a great design even better... but they've done it". IGN. Archived from the original on April 26, 2004. Retrieved June 4, 2014. ^ Perry, Douglass C. (October 7, 2004). "Tony Hawk's Underground 2". IGN. Retrieved September 6, 2017. ^ "Tony Hawk's Underground 2". GameSpot. Archived from the original on March 4, 2009. Retrieved September 6, 2017. ^ Bramwell, Tom (August 10, 2004). "Tony Hawk's Underground 2". Eurogamer. Retrieved September 6, 2017. ^ "Tony Hawk's Underground 2 Review for Xbox". 1UP.com. October 29, 2004. Archived from the original on March 18, 2015. Retrieved December 10, 2012. ^ "Tony Hawk's Project 8 Review". GameSpot. ^ "Tony Hawk's Proving Ground (xbox360: 2007): Reviews". Metacritic. Retrieved March 23, 2008. ^ "Tony Hawk's Proving Ground (ps3: 2007): Reviews". Metacritic. Retrieved March 23, 2008. ^ "Tony Hawk's Proving Ground (ps2: 2007): Reviews". Metacritic. Retrieved March 23, 2008. ^ "Tony Hawk's Proving Ground (wii: 2007): Reviews". Metacritic. Retrieved March 23, 2008. ^ "Tony Hawk's Proving Ground (ds: 2007): Reviews". Metacritic. Retrieved March 23, 2008. ^ "Tony Hawk's Proving Ground Reviews". GameRankings. Retrieved March 23, 2008. ^ "Tony Hawk Ride". Metacritic. ^ "Tony Hawk: Vert - IGN.com". ^ "Tony Hawk: RIDE (Game) - Giant Bomb". Giant Bomb. ^ "Tony Hawk Ride". GameSpot. ^ "Tony Hawk: Ride review". ^ Tony Hawk: Ride review, Game Informer 201:82. ^ Vargas, Nic (July 18, 2012). "Tony Hawk's Pro Skater HD Review". IGN. Retrieved July 23, 2012. ^ "Tony Hawk's Pro Skater HD - Review". July 19, 2012. Retrieved July 23, 2012. ^ Sullivan, Lucas (July 18, 2012). "Tony Hawk's Pro Skater HD review". GamesRadar. Retrieved July 23, 2012. ^ Rubens, Alex (July 18, 2012). "Tony Hawk's Pro Skater HD Review - Xbox 360". G4TV. Retrieved July 23, 2012. ^ Rudden, Dave (July 18, 2012). "Tony Hawk's Pro Skater HD review". Official Xbox Magazine. Retrieved July 23, 2012. ^ a b c d e "ELSPA Sales Awards: Platinum". Entertainment and Leisure Software Publishers Association. Archived from the original on May 15, 2009. ^ a b c d e Caoili, Eric (November 26, 2008). "ELSPA: Wii Fit, Mario Kart Reach Diamond Status In UK". Gamasutra. Archived from the original on September 18, 2017. ^ "PS2 Top 20". GamesIndustry.biz. November 22, 2003. Archived from the original on November 29, 2014. Retrieved November 13, 2014. ^ "XBox Top 20". GamesIndustry.biz. November 22, 2003. Archived from the original on November 29, 2014. Retrieved November 13, 2014. ^ "GameCube Top 20". GamesIndustry.biz. November 22, 2003. Archived from the original on November 29, 2014. Retrieved November 13, 2014. ^ "XBox Top 20". GamesIndustry.biz. January 24, 2004. Archived from the original on November 29, 2014. Retrieved November 13, 2014. ^ "GameCube Top 20". GamesIndustry.biz. January 24, 2004. Archived from the original on November 29, 2014. Retrieved November 13, 2014. ^ "PS2 Top 20". GamesIndustry.biz. February 21, 2004. Archived from the original on November 29, 2014. Retrieved November 13, 2014. ^ "US Platinum Videogame Chart". The Magic Box. December 27, 2007. Archived from the original on April 21, 2007. Retrieved June 4, 2014. ^ "Player's Choice". Nintendo.com. Archived from the original on February 20, 2007. Retrieved November 13, 2014. ^ McWhertor, Michael. "Tony Hawk Ride Grinds Up 114,000 In Sales". ^ Robert Purchese. "Tony Hawk Shred sold how many?". Eurogamer. ^ "Tony Hawk: Shred Bombs In North America". GamingUnion.net. Retrieved November 17, 2010. ^ Plunkett, Luke. "Fans Are Making The Ultimate Tony Hawk Game". ^ Gerardi, Matt. "Get Involved, Internet: Help fund a Tony Hawk's Pro Skater documentary". ^ "Pretending I'm a Superman The Tony Hawk Game Story". Indiegogo.